The Barbados Nation Newspaper was established in 1973 and in the 38 years of it's existence this newspaper has become the leading print news source on the island. 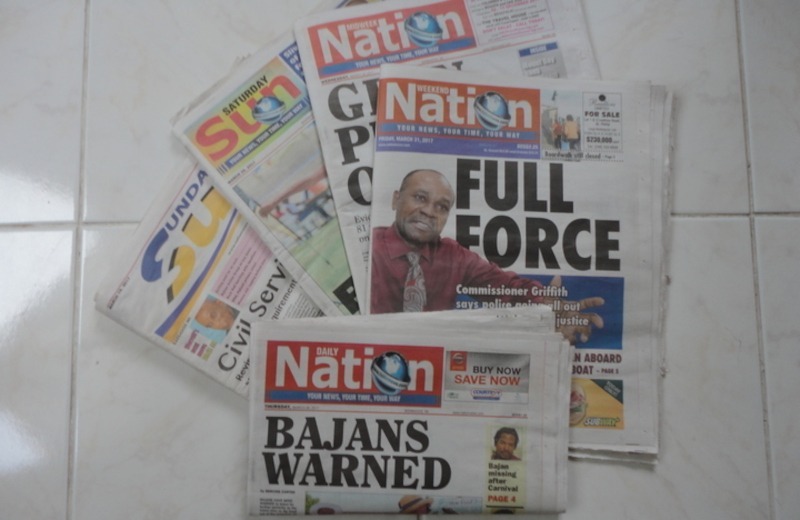 Published by the Nation Publishing Company, Nation news is an attractive paper printed in colour and branded according to the various days of the week. The branded name of the daily publications are as follows Mondays, Tuesdays and Thursdays, it's called the Daily Nation. Wednesdays it's the Midweek Nation and Fridays the Weekend Nation. On weekends the Daily Nation is the Saturday Sun and Sunday Sun respectively. Each daily edition comprise a section on local news, classifieds, sports, lifestyle, commentary, community, business, Regional and international news. So no matter your taste or inclination there is something in each publication for everyone. Here is a closer look at each section published in the Barbados Nation News paper. The local news section of the Nation is the perfect place to find out whats happening on the ground in Barbados. Whether its whats happening in education, entertainment or tourism you'll want to log on to this section. The classifieds section has wealth of useful information especially in the following categories general listings, family notices, employment, real estate and other services. If you are a returning national or a potential visitor to the island the real estate section of the classifieds is great. It feature a number of properties for sale as well as those for rent both long and short term. Its great place to start you accommodation or employment search just remember you'll need a work permit if you are a non-national. You'll find an action pack sports section in all of the various editions of the Barbados Nation newspaper but sports enthusiast will love the full color in the Midweek Nation. The Weekend Nation and the Sunday Sun are excellent. The Nation news sports cover local, regional and international sports action with extensive coverage of cricket and soccer. So the Nation sports pages are the place to fin out about local cricket, soccer and rallying. The lifestyle section of the newspaper focus on local personalities or in some cases any celebrities that maybe visiting the island. This gives readers the opportunity to learn a bit more about these persons. You'll learn more about their lifestyles... style of dress home decor and what gets them going. In the Weekend Nation these special features are carried in the "We Magazine" while in the Sunday Sun you'll find the features in the "Easy Magazine". Added to these section you'll also find sections on live events, commentary, community and business.